Video clip synopsis – Liz Jacka describes how the radio industries of the US, UK and Europe were established as either public or commercial broadcasting. Broadband MP4 abclass_bb.mp4 (4.1MB), suitable for iPods and computer downloads. 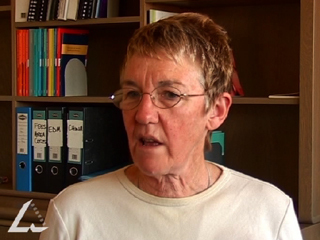 This interview with Liz Jacka was recorded for the website From Wireless to Web, produced in 2005. The Government set up a two-tiered licensing system for the fledgling broadcast industry. 'A’-class radio stations were funded by listeners’ licence fees collected by the Government, and minimal advertising (program sponsorship). 'B’-class licences were the second type available to potential broadcasters, differing from the 'A’-class in financing structure. 'B’-class licence holders received no revenue from government, but could generate their income by selling airtime to advertisers. Licences were granted for five year periods. In 1932 the Government took over licences for all the 'A’-class stations, and contracted the production of radio programs to an organisation called the Australian Broadcasting Company, the forerunner of today’s Australian Broadcasting Corporation (ABC). What were the two models of radio licensing when radio was starting up in Australia in the 1920s? What were the main characteristics of each model? What do you think the implications of each model are? What do you think were some of the problems you might face if you were setting up a radio station and broadcasting network. Think about areas such as programming, finance, distribution and reach. What model did Australia choose? What do you think this has meant for broadcasting in Australia? Have any media forms other than radio followed this model? Do you think this model will work for new media forms or for media in the future? Inglis, KS (Kenneth Stanley), “On the Air” This Is the ABC: the Australian Broadcasting Commission, 1932–1983, Melbourne, Melbourne University Press, 1983, pp. 5–24. Miller, T & Turner, G. “Radio” The Media & Communications in Australia, Eds Stuart Cunningham & Graeme Turner, Crows Nest, NSW, Allen & Unwin, 2002, pp. 133–152.